The FREQUENCY GROUPS module is designed to allow you to give a name to a collective group of frequencies, and also create, view, or edit frequency groups. For example you could give a Frequency Group the name of a tower site. Then, in the Frequencies Module, you could list all the frequencies used at that site. 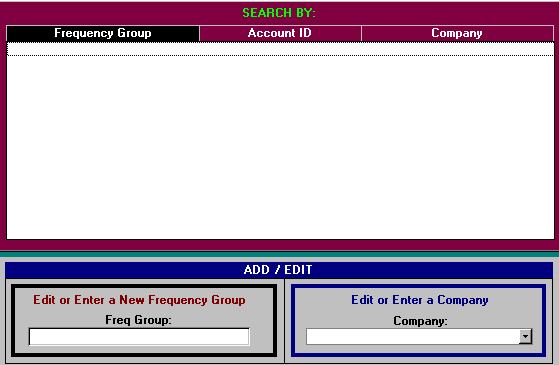 Also, each frequency group may be associated with a specific Account ID (Company). ShopWare™ is a trademark of ComPros, Inc.